Having never held any elective office prior to winning her House seat, Mary Bono transitioned over the course of more than 14 years from a wife of a celebrity-turned-Member-of-Congress to a Representative in her own right. “When Sonny was in office, I never spoke on issues. It was my responsibility to be a loving wife rather than a lobbyist,” she told the Orange County Register in 1998. “This is my chance to represent myself.”1 Bono eventually earned a reputation as a moderate on social issues, became an advocate for environmental protections, and—from her perch as chair of the Subcommittee on Commerce, Manufacturing and Trade (under the Energy and Commerce Committee)—recognized as one of Congress’s leading advocates for curbing prescription drug abuse. Mary Whitaker was born in Cleveland, Ohio, on October 24, 1961, one of four children raised by Clay Whitaker, a surgeon, and Karen Whitaker, a chemist. When she was two years old her family—including siblings Stephen, David, and Katherine—moved to South Pasadena, California, where she grew up as an accomplished gymnast.2 In 1984, she earned a B.A. in art history from the University of Southern California. While celebrating her graduation with a meal at BONO Restaurant, she met the owner, entertainer Sonny Bono. In February 1986, she married Bono and eventually raised two children with him, Chesare and Chianna. Mary Bono worked as a personal fitness instructor and helped managed Bono’s businesses. From 1988 to 1992, Mary Bono served as the first lady of Palm Springs, California, while her husband was mayor. During that time, she also served on the board of the Palm Springs International Film Festival. In 1994, Sonny Bono was elected to the U.S. House as a Republican in a district encompassing the city of Palm Springs. As with many previous congressional widows, her term in the 105th was, in part, a memorial to her late husband.7 She generally supported Sonny Bono’s legislative positions as an advocate for decentralized government authority and greater local control, particularly in the education field. She continued Sonny Bono’s work to preserve the Salton Sea, a southern California lake—half of which lies in her district. In late 1998, Congresswoman Bono and other California Representatives convinced the House to fund an environmental study and begin the process of cleaning the Salton Sea. 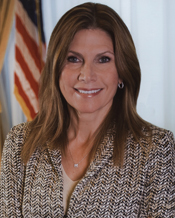 Mary Bono also directed a copyright extension bill through the House which had been introduced by her husband. The biggest vote of Representative Bono’s first term came in her role as a member on the House Judiciary Committee—which had opened impeachment proceedings against President William J. “Bill” Clinton. “I try not to think about it too often,” she said at the time. “I try to focus on the day ahead of me, the issues right in front of me. If I didn’t do that, I would become very overwhelmed.”8 As the committee’s most junior member, she began by often yielding her time for questions to other Members. But by the end of the process she had largely won favorable reviews with her thoughtful examination of witnesses. Bono supported bringing an impeachment motion to the House Floor and, along with the Republican majority, later voted to impeach the President. In May 2013, Bono Mack and Connie Mack—who also lost his 2012 bid for a Florida Senate seat—announced their impending divorce.25 She currently works for a California-based consulting firm. 1John Hughes, “On Her Own: People Know Sonny Bono’s Widow, But Do They Know Mary Bono?” 29 March 1998, Orange County Register (Santa Ana, CA): E1. 3Frank Bruni, “The Widows Run,” 29 March 1998, New York Times Magazine: 34. 4William Claiborne, “Mary Bono Wins House Seat,” 8 April 1998, Washington Post: A4. 6Garrison Nelson and Charles Stewart, III, Committees in the U.S. Congress, 1993–2010 (Washington, D.C.: Congressional Quarterly Press, 2011): 596; Congressional Directory, 112th Congress (Washington, D.C.: Government Printing Office, 2012): 476; “Women Members' Committee Assignments (Standing, Joint, Select) in the U.S. House, 1917–Present,” http://history.house.gov/Exhibitions-and-Publications/WIC/Historical-Data/Women-Committee-Assignments/. 7Lorraine Adams, “Keepers of the Flame,” 1 November 1998, Good Housekeeping 227, no. 5: 136; Jeanne Marie Laskas, “Oh, My God, We’re Not Blond Anymore: The Transformation of Mary Bono,” 1 July 1999, Esquire 132, no. 1: 122. 8Lloyd Grove, “In the Thick of It: For Mary Bono, A Year of Decisions Topped by One Vote,” 11 December 1998, Washington Post: D1. 10Politics in America, 2002 (Washington, D.C.: Congressional Quarterly Inc., 2001): 148–149. 12Politics in America, 2012 (Washington, D.C.: Congressional Quarterly Inc., 2011): 151. 13Familial Connections of Women Representatives and Senators in Congress,” http://history.house.gov/Exhibitions-and-Publications/WIC/Historical-Data/Familial-Connections-of-Women-Representatives-and-Senators-in-Congress/. 14Keith Matheny, “It’s Now ‘Bono Mack’ for Mary,” 20 December 2007, Desert Sun (Palm Springs, CA): B2. 15Deborah Barfield Berry, “Legislation Targets Online Pharmacies,” 17 October 2008, Desert Sun: B4. 16Johnny Dodd, “Mary Bono Mack and Her Son Chesare Back from the Edge,” People 17, no. 6 (February 16, 2009): 107–109. 17Subcommittee on Commerce, Manufacturing and Trade, Committee on Energy and Commerce, “Rep. Mary Bono Mack Holds A Hearing on Prescription Drug Diversion,” 112th Cong., 1st sess., 14 April 2011. 18See H.R. 4956, introduced in the 111th Congress on March 25, 2010, and H.R. 1316, introduced on April 1, 2011, in the 112th Congress. 19Politics in America, 2012: 150. 20“Election Statistics,” http://history.house.gov/Institution/Election-Statistics/Election-Statistics/; Politics in America, 2012: 151. 21Marcel Honore, “Mary Bono Mack, Raul Ruiz Debate Spirals into Personal Attack Slugfest,” 13 October 2012, Desert Sun: n.p. 22Erica Felci, “Raul Ruiz Bests Mary Bono Mack in Fundraising in First Quarter for Congressional Race,” 17 April 2012, Desert Sun: n.p. ; Xochitl Pena, “Bill Clinton Endorses Raul Ruiz in House Race,” 24 October 2012, Desert Sun: n.p. 24Erica Felci, “Dr. Raul Ruiz Victorious as Rep. Mary Bono Mack Concedes Race,” 9 November 2012, Desert Sun: n.p. 25Ledyard King, “Connie Mack, IV, Mary Bono Mack Announce Divorce,” 25 May 2013, The News Press (Fort Myers, FL): 1. She changed her name back to Mary Bono. "Mary Bono" in Women in Congress, 1917-2006. Prepared under the direction of the Committee on House Administration by the Office of History & Preservation, U. S. House of Representatives. Washington: Government Printing Office, 2006.